Long-time dark horse Africa is now taking centre stage with the announcement of the Mara phone project that is touted to take the smartphone business by storm. 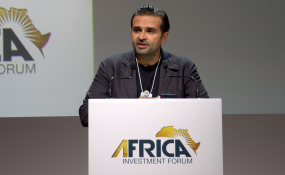 Developed by Rwandan businessman and billionaire Ashish Thakkar, the Mara group at the Africa Investment Forum announced ambitious plans to develop manufacturing plants in Rwanda and in South Africa. During South Africa's recently held inaugural investment conference, Thakkar announced that his company would be investing R1.5 billion in a South African venture over the next five years. At a media briefing on Friday morning at the Africa Investment Forum in Sandton, Johannesburg, Thakkar said there were further plans to develop the phone in plants across the continent's five regions. "We all know the importance of high quality and affordable smartphones and the impact this can have on the continent. Quality smartphones mean we can truly enable financial inclusion, micro-lending and micro-insurance. This can translate into better education, digital healthcare and agriculture efficiency and improve commerce. "If this is all going to be possible... we [need] quality and affordable smartphones. Unfortunately, we have quality smartphones but they are not affordable and if it is affordable, it is not quality," he said. None of the millions of smartphones found worldwide are from Africa, Thakkar said. "We have a few that are assembled in Africa but nothing is truly being manufactured in Africa. Thanks to the African Development Bank, that changes today," said the businessman. Thakkar said the Mara smartphone will be the first high-quality, affordable smartphone to be made on the continent. "This has truly been made possible thanks to the support from the African Development Bank and its strategy of industrialising Africa. We'll work with them to roll this out and scale it out. We all believe that it is time to shift the narrative, which is why we are also excited that the phone will also be sold in Europe," he said. The phones will also be exported and sold in Europe, making Mara a global player in the market. The project is in partnership with Google. "This will truly be transformative. It will create thousands of jobs directly and eventually hundreds of thousands of jobs indirectly in the ecosystem across the continent," Thakkar said. AfDB President Akinwumi Adesina said such transactions fitted perfectly with the forum's theme of less talk and more deals. The announcement, he said, proved that the continent had great untapped potential that was just waiting to be given a chance. "I couldn't be prouder. It just tells you the quality of entrepreneurship that we have in Africa... Africa is not just a market for others. Africa is going to be the manufacturing base to create markets within Africa and also have markets outside Africa. "We are not just going to be a market for others but we are going to dominate others, which is what the Africa Investment Forum is all about," Adesina said. Investors needed to give budding entrepreneurs a chance. "Africa is already leading the world when it comes to mobile money from M-pesa... We are very proud of that," he said.